Nextgen Biotech was incorporated in Delhi, 2013 is a global leading pharmaceutical organization firmly focused on its aim to discover, develop and deliver innovative medicines to contribute the health care industry across the world. We have emerged as a manufacturer and wholesaler of a wide series of medicines under the potential disciplines such as Pharmaceutical Injections, Oncology Injections, Cancer Treatment Capsules, Cancer Treatment Injections, Antiviral Injection and Pharma Tablets. Around the globe, our medicines help patients to get relief from decease like cancer and tumors. In short span of time, we have become as a successful pharmacy company which believes that good health is vital for all of us and finding a cost-effective and sustainable solution to the most alarming health care challenges is the need of the hour. We at Nextgen Biotech are committed to employ the best available resources and science to improve healthcare of the human being. Our organization is equipped with modernized facilities including infrastructure, technology and people. Our qualified and specialized professionals are great advantage to us for supporting prevention and wellness along with treatment and cure of various deceases across a wide spectrum of the disciplines. Our clients are distributed across the world to encourage us to become more prominent and effective in the healthcare industry. Our partner Mr. Sudarshan Sajwan who is a successful entrepreneur in the medical industry is leading the whole organization towards achieving coveted position in the market. 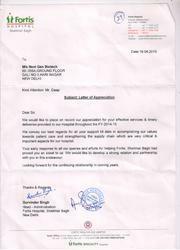 We have appreciated by Fortis Hospital (Shalimar Bagh). Quality is the topmost priority of our organization. We have set up a separate department of quality control which ensures that highest international quality standard is followed. This department comprises well experienced and qualified quality auditors who check every medicine which is being sourced. Also, we ensure that every consignment, before being dispatched, is tested on different parameters of quality.